A former Kearney icon has been replicated at the Great Platte River Road Archway. 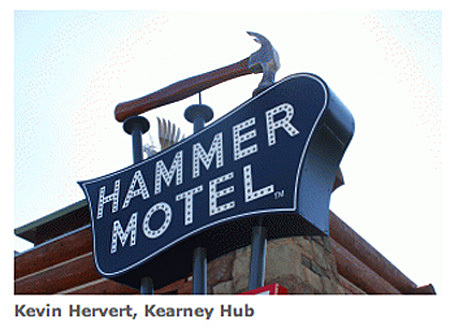 The Kearney Hub reports that the archway now displays a Hammer Motel sign, a replica of a much larger sign that once stood at the hotel on US 30 at 19th Ave on the west side of Kearney. Ronnie O’Brien, director of education and the Nebraska director for the Lincoln Highway Association, said the Hammer Motel sign was known across the country. 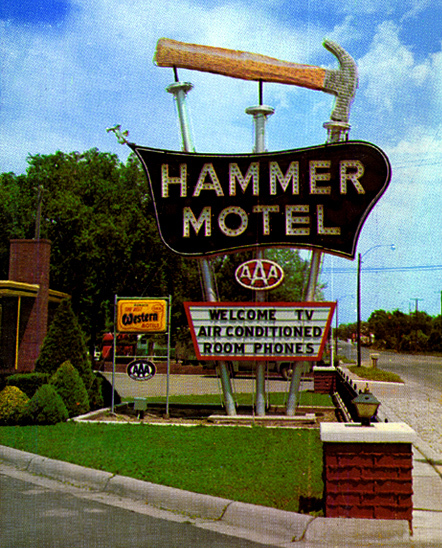 The Hammer family operated the motel from 1947 to 1987. It then served as University of Nebraska at Kearney student housing until 1995, when it was razed. A historical marker commemorating a Lincoln Highway Seedling Mile was dedicated in April at the site of the motel. 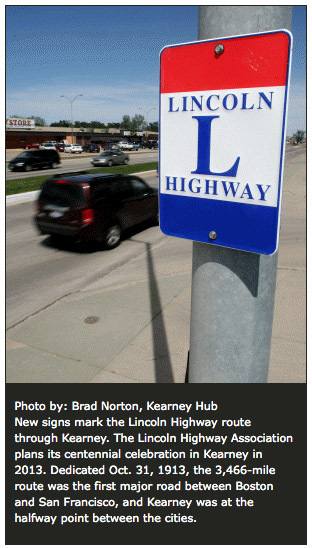 The Kearney Hub reported on the Lincoln Highway Association’s plans to celebrate the road’s centennial in the Nebraska city, including new signage. “This is something that we have wanted to accomplish for a number of years, and it’s wonderful to see the signs up representing the history that once passed through our community,” said Sarah Focke of the Kearney Visitors Bureau. The visitors bureau has been working with several other Kearney organizations to erect the 12 signs and to lay the groundwork for the Lincoln Highway Association’s 2013 convention in Kearney. The markers, with the letter “L” and red and blue bands, are going up along Highway 30, which passes east to west through Kearney. A full article was in the May 26 Hub print edition. Here’s another nice article from The Canton Repository about the efforts of Brian Cassler to preserve a bit of the Lincoln Highway. As part of earning his Eagle Scout badge, Cassler cleaned and organized more than 2,000 bricks from Canton that will be used to recreate a portion of the Lincoln Highway at the Great Platte River Road Archway in Kearney, Nebraska. The archway will host the 2013 centennial conference of the Lincoln Highway Association. “In 2007, when they (Canton) tore up Tusc (Tuscarawas Street), they found a couple thousand (original) bricks,” said the 14-year-old. “They gave them to the Eastern Lincoln Highway Association to do whatever they wanted to do with them. An Eagle Scout project for Brian Cassler will be a gift for Lincoln Highway fans forever. 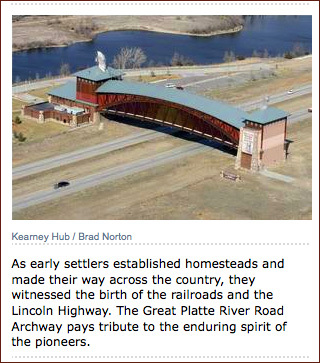 The Kearney Hub reports that Cassler’s efforts will result in a recreated stretch of the transcontinental road at the Great Platte River Road Archway that spans I-80 in central Nebraska. 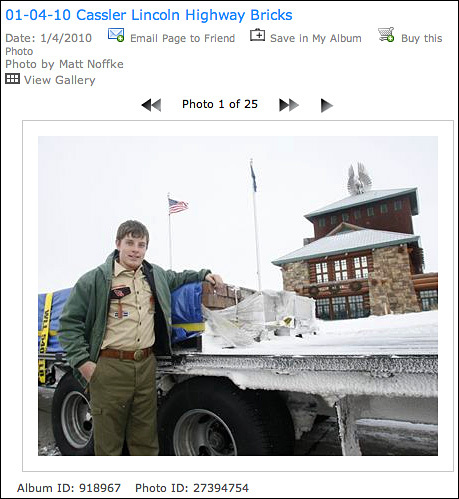 The Kearney paper has 25 photos online, as seen in the screen capture below. “The original paving bricks are getting pretty rare,” said Ronnie O’Brien, director of education/operations at the archway. “We were going to contract with a brick company to recreate a piece of the Lincoln Highway.” Instead, workers in Canton, Ohio, a city of 78,000, found original bricks in 2008 while reconstructing city streets. Brian Cassler of Canton took on a project of cleaning, organizing and palletizing the [2,200] bricks from the famous highway. Cassler, along with trucker Tim Wunsch of Fort Morgan, Colo., delivered the load of pavers to the archway Sunday. “The city of Canton donated the bricks to the archway to be used in the display,” O’Brien said. “The bricks had been under other construction, and they were dirty and in a huge pile. They needed to be cleaned up and scraped before they could be hauled here.” Cassler, who took on the project as part of his Eagle Scout requirements, spent several months preparing the bricks. Cassler’s father runs the Lincoln Highway Trading Post in Canton. Check out highway merchandise at the Lincoln Highway Trading Post online store. The Omaha World-Herald also ran a feature story about the project. Fred Hammer wrote to say hello after reading my post on the history of his family’s motel along the Lincoln Highway in Kearney, Nebraska: “I grew up in that motel — watched it grow from 8 rooms to 35. My dad was one of the founders of the Best Western chain and took pride in that organization…. In the landscaping I donated to the university, I had three brick columns placed in the southwest corner, similar in shape to what was at the motel — and, in one of the columns, there is embedded a plaque which has a miniature imprint of the motel sign” So next time you’re in Kearney, take the time to find the honorary landscaping and plaque on Watson Blvd. at 19th Street. The January 2009 newsletter of the Nebraska Lincoln Highway Association includes a number of interesting stories and a feature on theaters along the route. That story noted that a drive-in theater in Kearney was badly damaged in the May 29 tornado, and insurance was not adequate to replace the screen, so it was torn down in July (seen here still on Google Maps). The state’s two remaining ozoners are not on the Lincoln. The same tornado also badly damaged the old Continental grain elevator in Shelton, and so it will be torn down too.